B.Positive Magazine \ Does Alabama Still Have A Chance At The National Title Game? 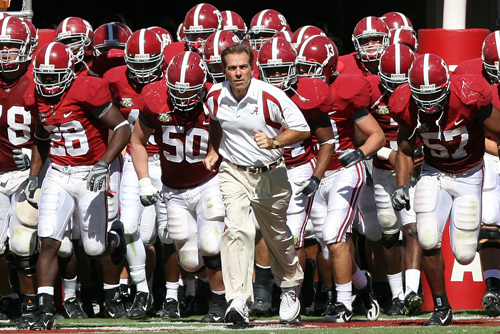 The University of Alabama has had a stellar football program for many years. Students and fans are well aware that their school will always have a fighting chance at a National Championship. To be a student at the University of Alabama during a National Championship Title would be ideal. But the odds of this are obviously slim. With that said, despite one loss, it should not be counted out this year. Alabama opened the season strong by defeating San Jose State 48-3. We now know that San Jose State is one of the weakest programs in all of college football, but it was an impressive win, nonetheless. Alabama followed that game up with a convincing 24-3 win over Penn State. This got fans excited. The following week, they played Duke, which they handled with ease, 62-13. Then came the big one. Alabama was due to face-off vs. Arkansas, in Arkansas. Most college football analysts felt this didn’t bode well for Alabama, but Alabama proved all the naysayers wrong, winning 24-20 on the road in very hostile territory. The next game vs. Florida was hyped up a lot, but that team is not the same without Tim Tebow. Alabama again won 31-6. This might have led to some overconfidence heading to South Carolina. This is especially dangerous since South Carolina has a knack for pulling off big upsets. And they did it once again vs. Alabama. South Carolina won this game 35-21. Alabama bounced back vs. Mississippi with a 23-10 win the following week, but there was some fire missing in that game. Alabama regained their fire vs. Tennessee, beating them by a score of 41-10. If the Alabama players feel as though they still have a chance, they will have a pretty good shot at getting to the National Title Game. It’s important to remember that Boise State is in the Top 5 and if they mess up at any point, they will be dropped quickly. Another important factor is that Alabama plays LSU soon, which can knock LSU out of the hunt completely, especially after losing to Auburn. But the most important game is the final game of the season. If Alabama can run the table until that point, they will play a high-ranked Auburn team and have an opportunity to make a big statement. Alabama needs to root for Auburn up until that game, so it will make an Alabama win more impressive. The bottom line is that if Alabama wins out, and if most of these wins are impressive, they will be brought up in National Title Game conversations. The key is that the players believe they still have a chance. Alabama is currently ranked #5. They are 7-1 overall and 4-1 in their conference. Tracy Hall is a guest writer and blogger for eDrugstore.MD, a safe U.S. medication facilitator since 2001 where customers can buy Viagra online & safely order Cialis in the convenience of their own home.